How many storage admins do you need? Are you any closer to backup nirvana? Everyone wants a say in e-mail management. Despite all the FUD surrounding IP SANs, early users say IP-based storage isn't all that difficult to manage and that performance is sufficient. The key is knowing what applications IP SANs should be used for. The cost of disaster recovery tools can be even more than the value of the data that these very tools are supposed to be protecting. Fortunately, newer approaches to DR are restoring sanity to this high-pressure task. In the health care industry, complicated regulations such as HIPAA, combined with new technologies that require enormous amounts of storage, are driving storage managers to the emergency room. Newsflash: Conventional data protection has reached its limits and will be dramatically changing in the next couple of years. But all roads don't lead to the same result. Here's how to analyze which route is best for you. Although storage resource management tools can be complicated to implement, they're a better alternative to breaking the bank and rushing out to purchase more storage. Get precise with your vendors on what you need and you'll wind up with better results. Everyone--except storage vendors--is concerned about security these days. Here's how to get them thinking in the right direction. When creating your dedicated storage management group, there are better ways to determine staff levels than relying on a simplistic metric based on the number of terabytes per manager. 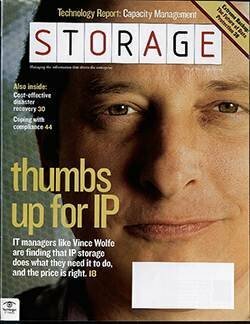 Storage Bin: Storage vendors should have knocked EMC down when they had the chance. Now, it may be too late. Why don't storage managers consider renting storage? Your pack-rat neighbor uses public storage to stash belongings that don't fit in his tiny townhouse. So why don't storage managers consider renting storage?